Our Nursery Room is a ‘home away from home’ for children between the ages of 6 weeks and 18 months. It is a special, cosy space maintained by our trained educators who are experienced and sensitive to the individual schedules and needs of infants. 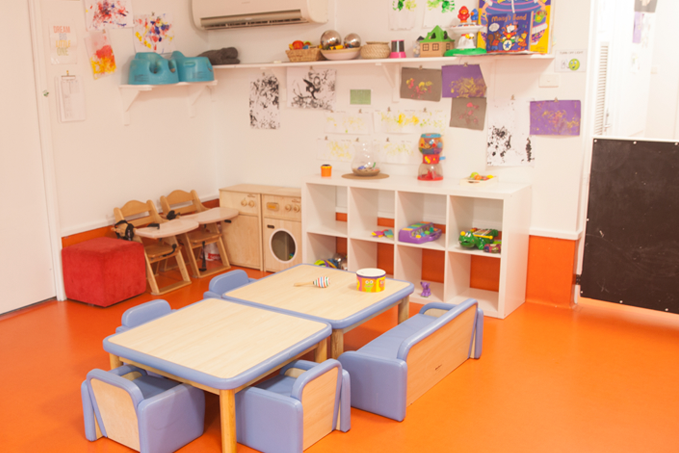 In the nursery, we cater to children’s individual play, sleep and eating routines. Two separate cot rooms allow educators to cater for children’s individual sleep times, while play continues for others. Mothers are welcome to breastfeed their babies when work schedules allow, and are encouraged to provide expressed milk or formula. We also work in partnership with parents to introduce new foods and wean children off bottles with a nutritious menu that is complete with a range of pureed, mashed and solid foods up to five times a day. We follow the children’s lead and provide responsive learning experiences to develop a range of skills. Language development is promoted through consistent talking during meal times, nappy changes, and play, and using songs, rhymes and books. We encourage physical development such as rolling over, sitting, standing or walking. Babies that are starting to lift their heads are encouraged through plenty of “tummy time” activities. The nursery has a range of toys for babies to explore including different textures, hard and soft surfaces and manipulatives that stimulate each child’s natural curiosity. Toys are cleaned and sanitised daily for safe sensory exploration including tasting, touching, smelling, looking and hearing. The nursery also has a designated outdoor space with climbing frames, slides, balance beams, and equipment for sand and water play and gardening. These support your children’s understanding of the natural world and assist in their physical development.